The arrival of wet season rains is a time of renewal – the wetlands are replenished, the frogs breed and provide food for many other creatures. 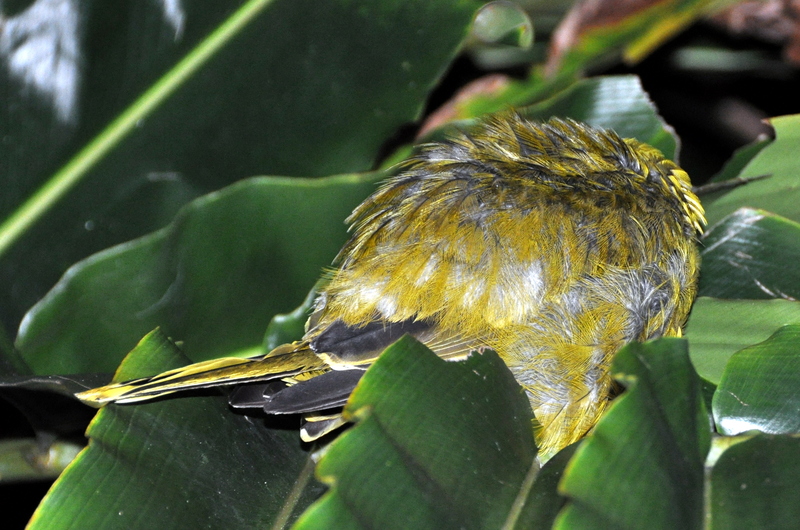 We find the sound and smell of the rain itself as well as the deafening cacophony of frog calls exciting ……. last night we had a look in the pond adjacent to our verandah. 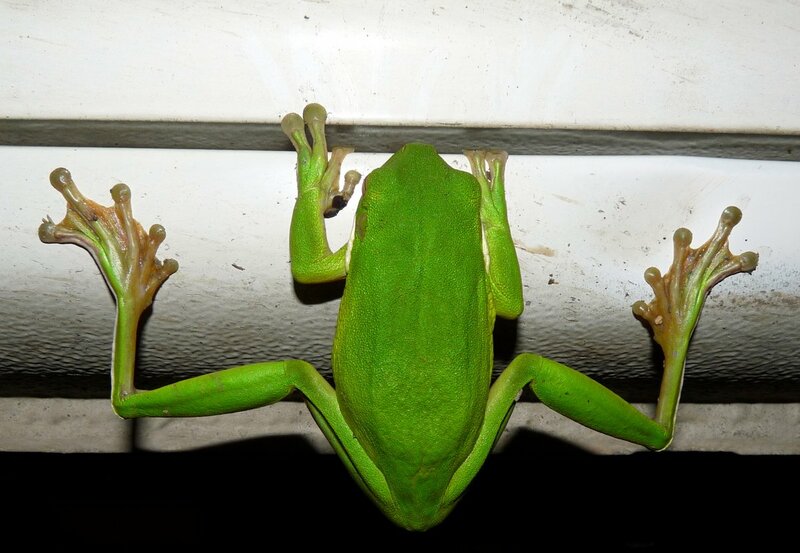 In the car-port a white-lipped green tree-frog (Litoria infrafrenata) was hanging onto our vehicle while numerous sedge frogs (Litoria bicolour, Litoria fallax) called and jumped around the house; several had to be taken outside again after they found their way inside. 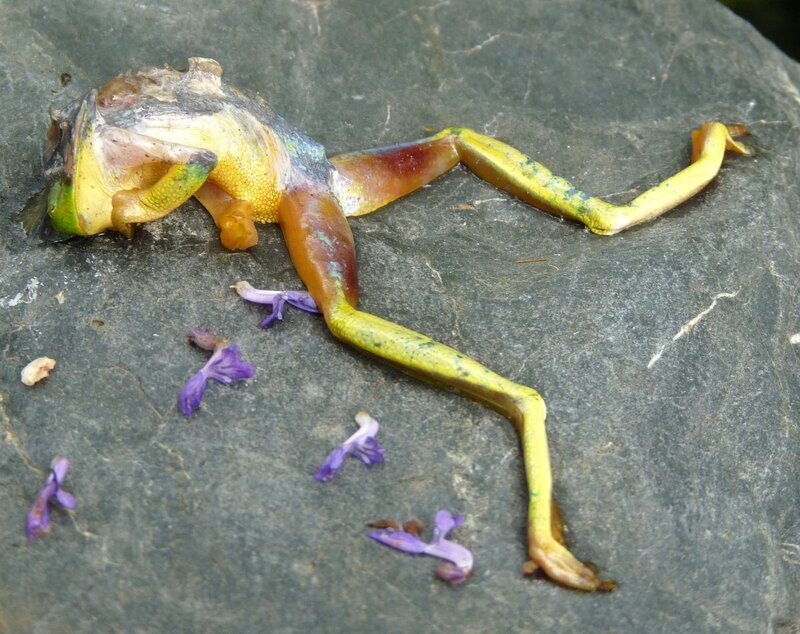 This morning we had a look for the remains of the spider’s meal; it was dragged up onto one of the rocks surrounding the pool – a somewhat gruesome sight softened by the flower petal decoration; exactly as found. 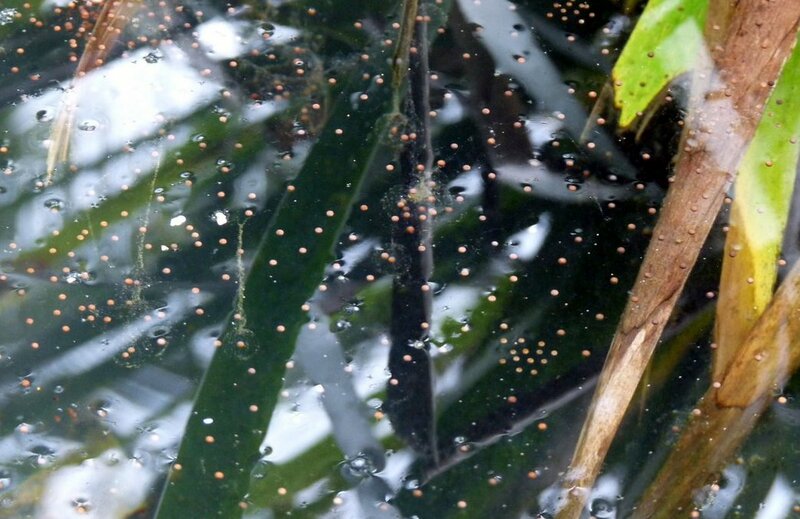 And so the circle of life continues – frog eggs (probably L. gracilenta) on the water below the frog corpse. Since Snail has been writing about Litoria junggay I decided we should join in the discussion by adding a couple of photos of the frogs we used to know as Litoria lesueuri or Stony-Creek Frogs. 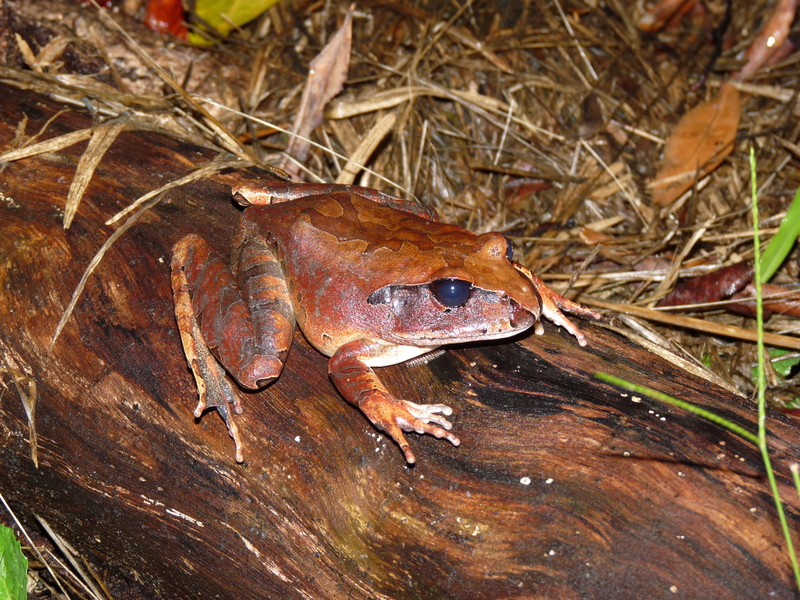 As Snail has mentioned, this species is now described as L. jungguy and L. wilcoxii and according to my “Rainforest Frogs of the Wet Tropics” by Conrad Hoskin and Jean-Marc Hero this distinction is based on genetic data as the two species are morphologically very similar and cannot be reliably distinguished in the field. As we are in the Northern part of the range we should be seeing Litoria junggay so I’m staying with that. These males are pictured sitting on the edge of our fresh-water swimming pool – I thought the bricks gave a good indication of their size. Inspired by Snail’s discussion I went out with a torch a couple of nights ago to see if I could find any female Stony-Creek frogs – we always have males sitting around the pool edge but the females are not as commonly seen. And I found one – the male had also found her and he wasn’t letting go even when she frog-leaped quite a distance into the garden. As you can see there is quite a difference in both the size and colour of the male and female of the species. 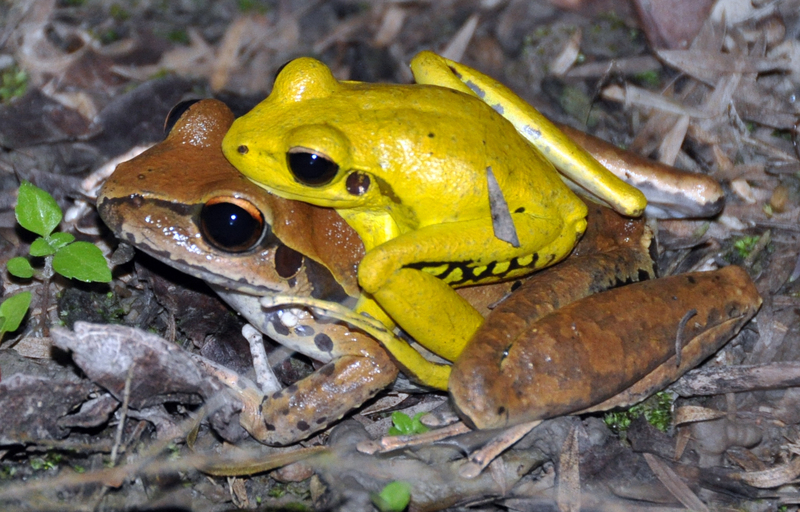 These frogs have one of the softest sounding calls of any of our frogs – more like a loud purr. They are commonly associated with rocky and sandy streams, the males often being found near water where as the females can be located some distance away. We are amused by the fact that they are attracted to our pool and breed in it quite successfully although they are described as ‘stream breeders’; we have water moving through an undergravel filter system and spraying over the surface of the pool for about 6 hours a day plus a small fountain which runs directly from a solar panel and is therefore dependent on the sunlight but this seems to be sufficient to keep quite a few different frog species happy as well as maintaining a lovely cooling off place for us. and this one was attempting to gain entry to our house in December last year. 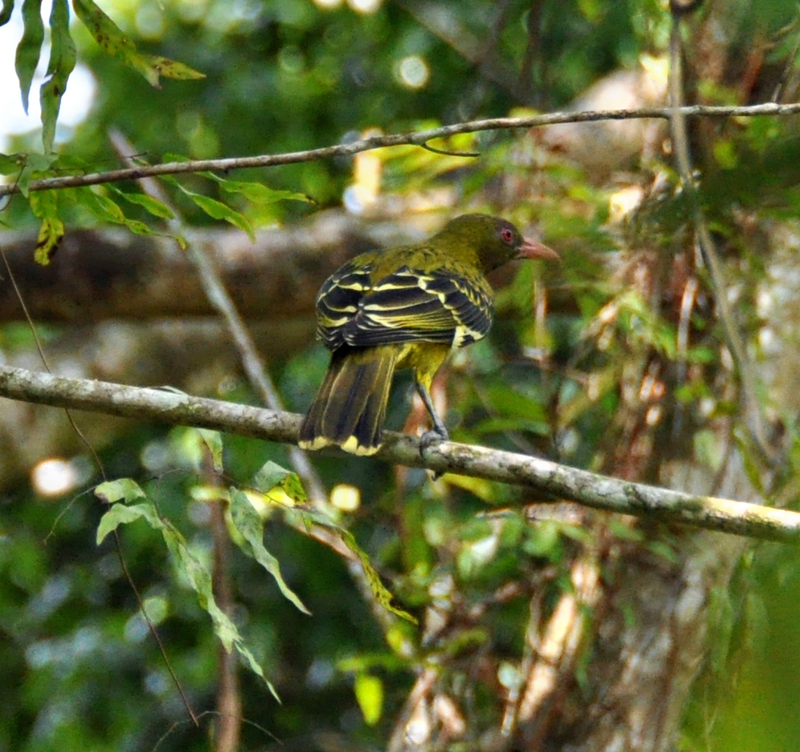 I have included the photo as it shows the colour variations between females as well as her inner thigh markings. And just to finish off, when I was walking back to the house from the pool the other night I noticed a fluffy ball on the leaf of a Ginger plant – it wasn’t at all disturbed by the flash from the camera as its head was tucked so far out of sight and I was careful not to brush against the leaf as I walked past. 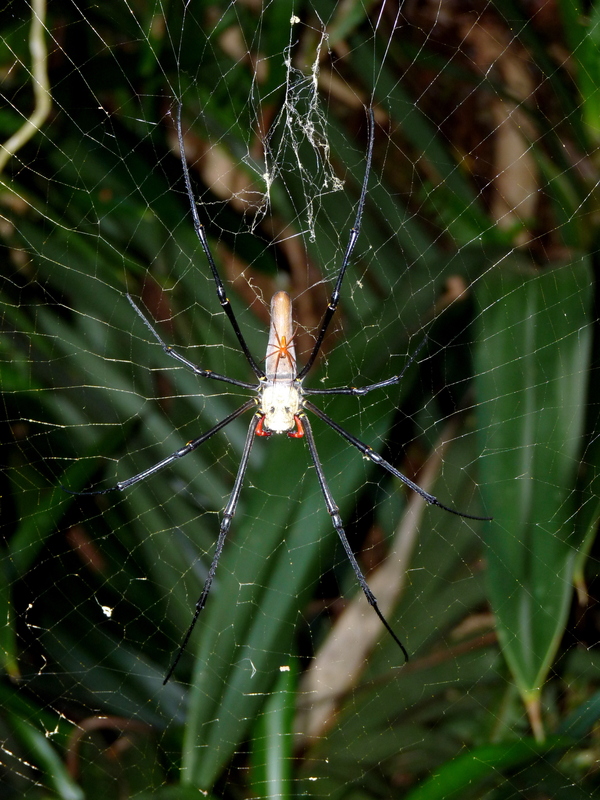 This is a more interesting photo of a younger Nephila pilipes clearly showing the diagnostic red palps although as the lighting was quite poor I had to use the flash and so her body colour is washed out . 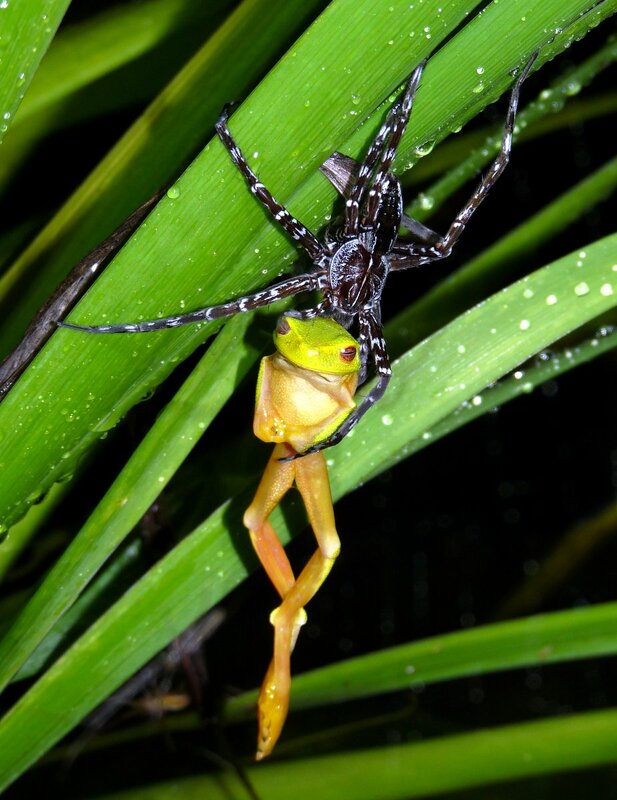 The small spider on her back is one of several males which are present on the web which is attached to a rare climbing Pandanus (Freycinetia marginata). 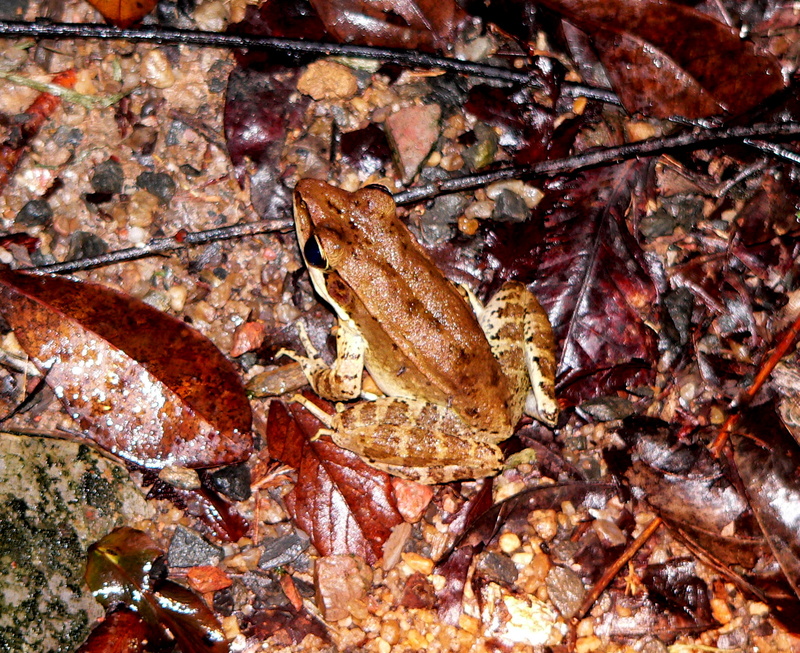 And this is an Australian Wood Frog (Rana daemeli) well camouflaged on some leaf litter. One of the many frog species on the increase at Wild Wings – always delightful to find that the eyeshine in the spotlight is another frog. 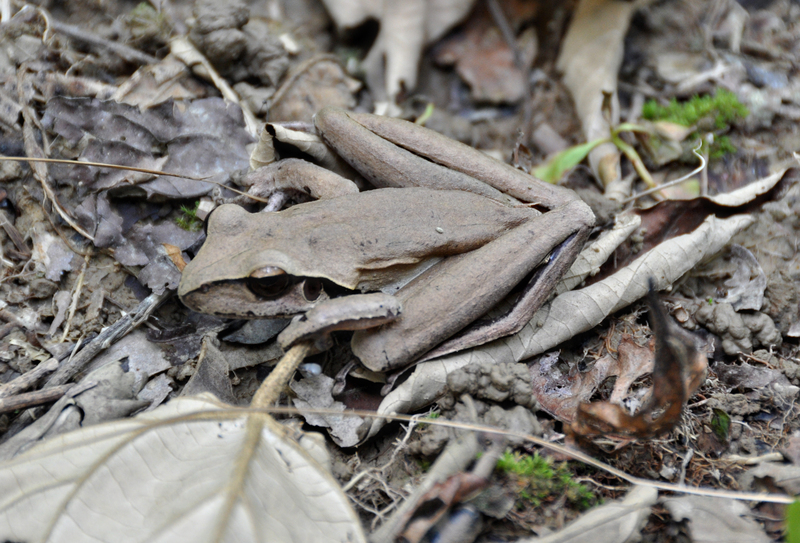 The deep single call of a Northern Barred Frog (Mixophyes schevilli) is a special excitement for us – further proof that our rehabilitation work is making a positive difference. Last night as we set off with camera and spotlights to try and photograph a Garden Spider, we heard the call and located the Northern Barred with comparative ease. They have a brilliant red eye shine – much brighter than the cane toads that we have been collecting around the property for more than two years. We carry out cane toad patrols on a regular basis through the year however during the wet season we go for an after dinner walk about 3 times a week. 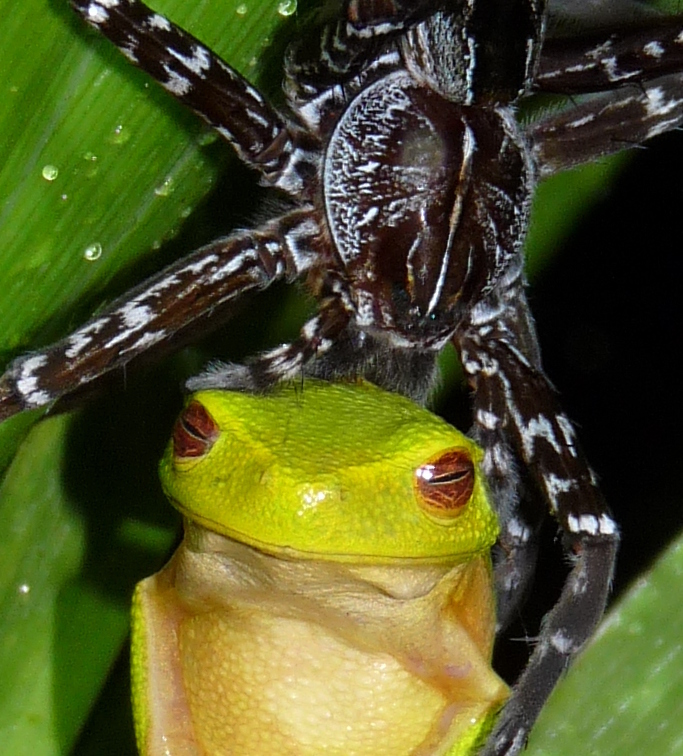 Although we have no illusions about being able to eradicate these poisonous pests we are seeing greater numbers of frogs and their associated predators. Our evening strolls with spotlights and bags bring us many unexpected delights – and the Garden Spider is a perfect example. 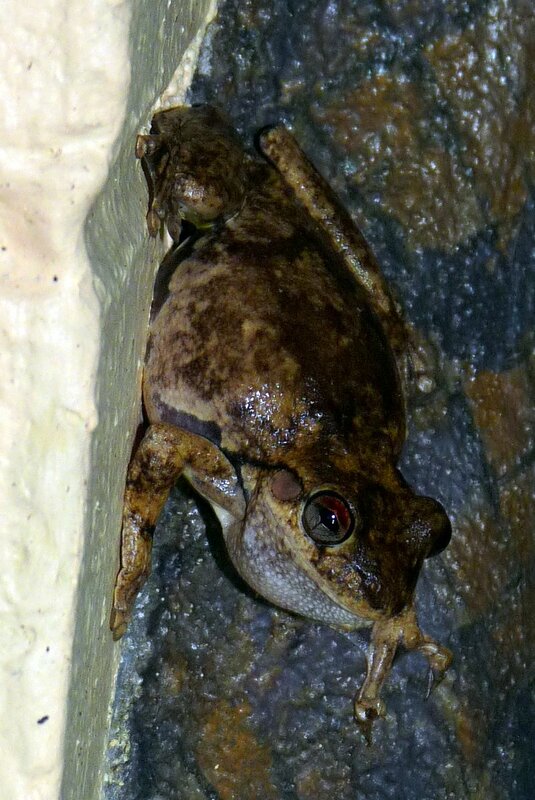 Photos coming soon……..
A soft purring call alerted us to the presence of these Lesueur’s or Stony Creek Frogs. 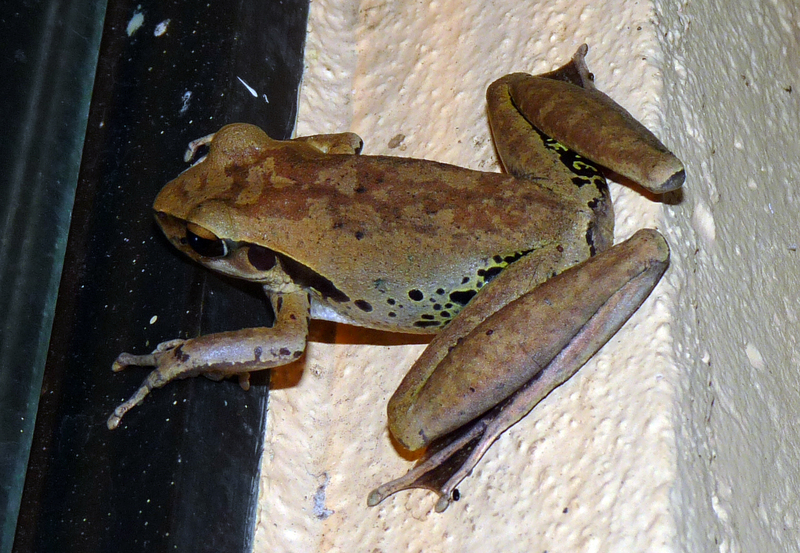 These frogs lack a vocal sac with which to amplify their call so they are not so obvious.